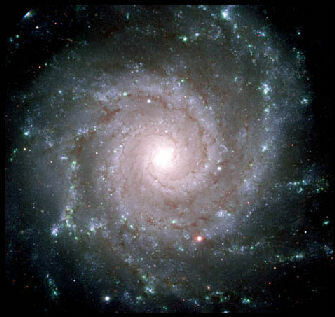 Spirals are a common natural form, appearing at all levels of nature. They are the natural product of Phi (Ф), which is also called the 'Golden Section' or the 'Golden Mean'. 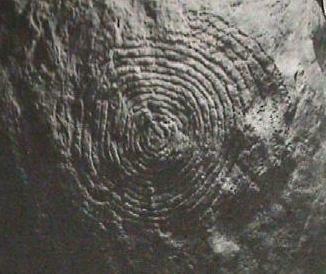 Prof. Alexander Thom suggested that some of the European megalithic spirals had been carved with mathematic precision, using a common unit of measurement associated to the Megalithic Yard. The mound at Newgrange has been dated at about 3,200 BC (Burl). 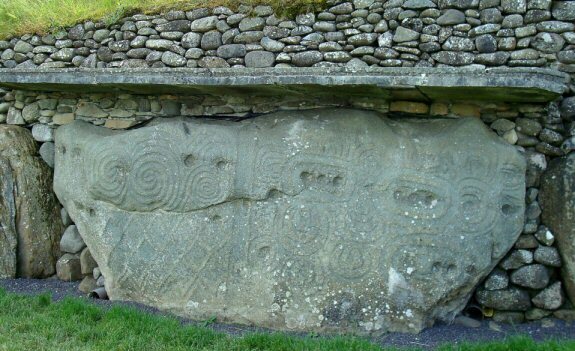 The passageway has been shown to possess both a solar orientation, and a secondary astronomic feature in its design called a 'light-box', of which three others have so far been identified (One at Carrowkeel, Ireland, one at least on the Orkney Islands, Scotland, and another other at Bryn Celli Ddu in Wales). All of the 'light-boxes' have one thing in common, which is that they were orientated to solar events. 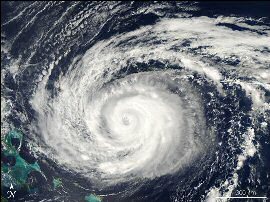 The spirals left of the central line rotate clockwise, whilst those on the right rotate in the other direction. The kerb-stone at the rear of the mound and diametrically opposite the front has a similar line down the centre. 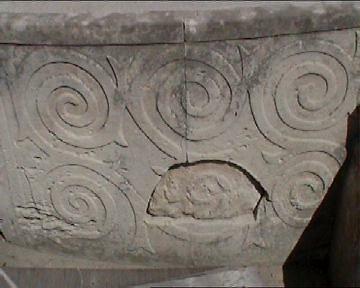 The spirals above are also from Newgrange, in the Boyne valley, Ireland. 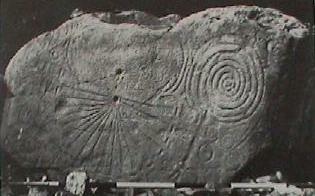 Kerb-stone from Knowth, Ireland, also a part of the Boyne Valley 'complex'. 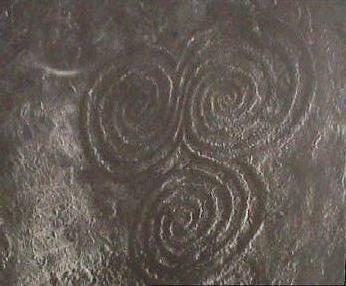 Spirals are a common feature of Irish megalithic art. They can be seen at numerous other Irish megaliths, although their exact meaning (If there is such a thing), is far from being understood. Being one of the earliest regions of megalithic activity in Europe, it is interesting to find one of the largest spirals in Europe here also. 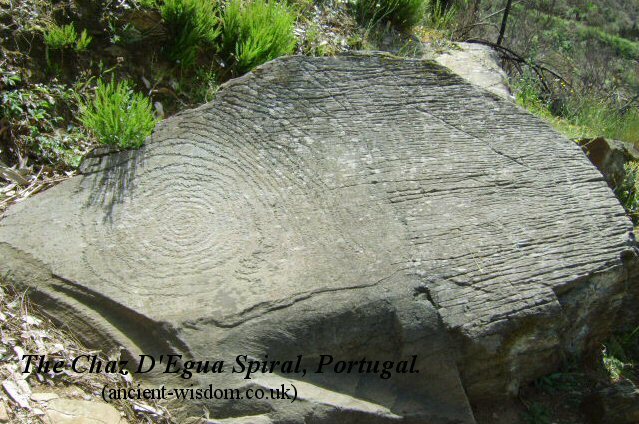 This recently discovered spiral-art (above), was found in the region of Piodáo in Portugal. The spiral is around 0.5m in diameter, possibly making it the largest known carved spiral in Europe. 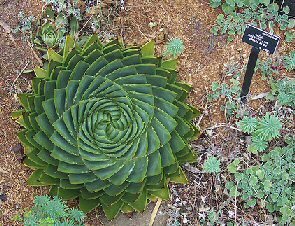 Unlike most spirals, this one sits alone on the side of a hill, with no obvious orientation or apparent purpose. Several other spirals along with various rock-art, stone phallus, cart-ruts and even signs of Christianisation make it probable that this inhospitable valley system was an important prehistoric site for a long time. Also from Portugal, the stone circle at Almendres which is considered to be one of the oldest oldest stone circles in Europe ('4th to 5th millennium B.C' - Site plaque - 2007. 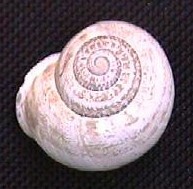 ), also has/had a spiral on one of it stones. 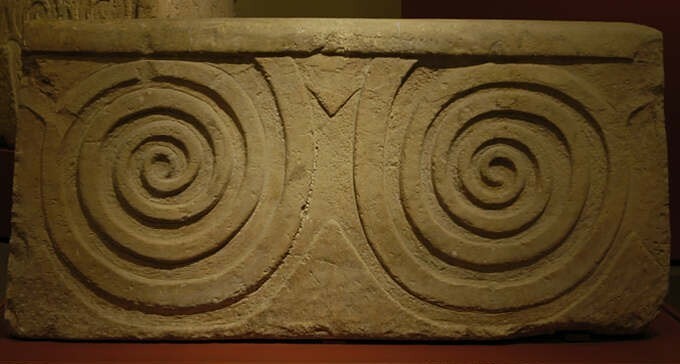 There are numerous spiral motifs in Malta, but they are decorative, 'floral' spirals, unlike the single examples found at many UK stone circles. Service and Bradbury (1), say that 'spiral patterns are associated with the great goddess'. A statement that makes sense in Malta., but nowhere else. 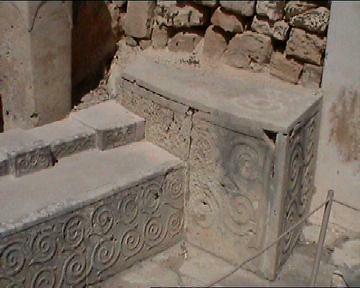 These 'floral-spirals' (above), come from the Tarxien in Malta. They show a strong similarity to Celtic and Norse motifs, but are dated far earlier at 3,000 -3,500 BC. The 'Westray Stone', from Pierowall (left). The Eday Manse stone, Isle of Eday. (right). The Flat Rocks of Helluland I (2)- with similar 'Solar-wheels' as those found in Ireland. The most famous American "sun spiral" was discovered by Anna Sofaer in 1977 near the entrance of Chaco Canyon at Fajada Butte. It was engraved on the cliff face and then covered over with three large slabs of stone, which were placed so that they combined to produce the now famous 'solar-dagger' of sunlight, which passes through the centre of the spiral each summer-solstice. Although commonly regarded as a 'sun' symbol, it has also been demonstrated that the same symbol and arrangement of stones could also be used for the lunar cycle. This offers the tantalising suggestion that the Anasazi Indians were aware of calculate the Metonic cycle. “Through the following months of July, August, and September, these two beams move steadily, day by day, to the right, until on the day of the fall equinox, September 21, the leftward beam, now much longer then the first, cuts through the center of the lesser spiral. Thereafter, the rightward movement continues, and this second beam ever lengthens. By noon on December 21, the day of the winter solstice, the two darts, now of equal length, perfectly frame the larger spiral, after which the movement, day by day, is from right to left. At noon on march 21, the day of the spring equinox, the positions of the light beams are exactly as they had been September 21, and by the summer solstice the cycle is completed. 2). G.T. Emmons. The Spiral, Sunburst and Petroglyphs of Wrangell Island, Alaska. 3). J .Campbell. Historic Atlas of World Mythology.